Enjoy our mobile field guide as you walk, hike, and play in the fall meadows. See other Field Guide posts here. Flat-top goldenrod provides nectar for many types of pollinators such as butterflies, wasps, both long- and short-tongue bees, flies, moths and beetles. One particularly interested beetle is named after the plant itself—the Goldenrod Soldier Beetle! Many people mistakenly believe they’re allergic to goldenrod , but in fact, what little pollen it has is too sticky to be blown around by the wind! Wherever you are, it is likely you will be able to find a few different kinds of goldenrod in the fall, all of which are suitable for medicinal purposes. After the Boston Tea Party, goldenrod tea replaced black tea in the States– “liberty tea,” and was used to boost the immune system before the winter months. More commonly known as yellow indiangrass, Sorghastrum nutans is a tall native grass that can be identified by its blue-green blades and the almost metallic yellow-gold sheen of its flowering heads. 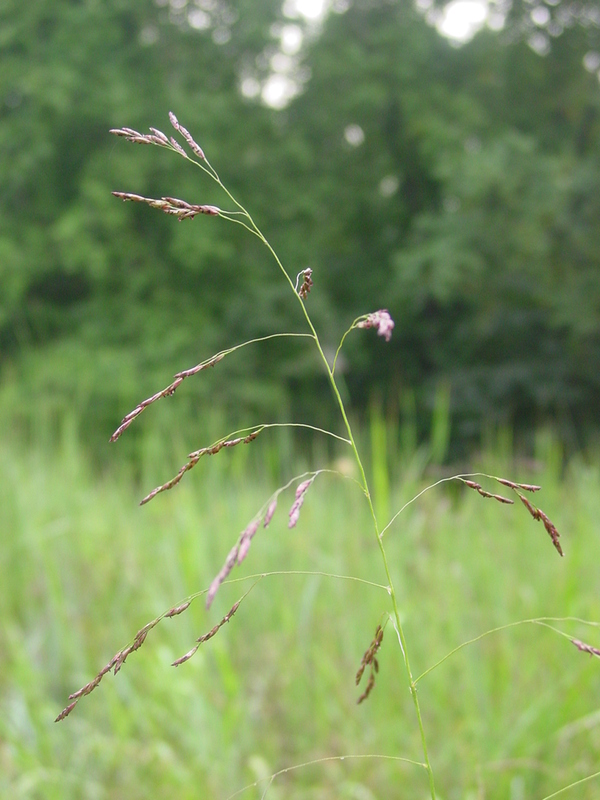 Standing at about three to five feet tall, Indiangrass is an excellent snack for deer, birds and other wildlife. Spotted jewelweed is an annual flowering plant that can be found growing along creek banks, and lives right along the edge of the Schuylkill Center’s own Springhouse Pond. One can easily identify this plant by submerging its leaves in the surface of a nearby water body—if they shimmer with a silvery dust, it’s jewelweed! 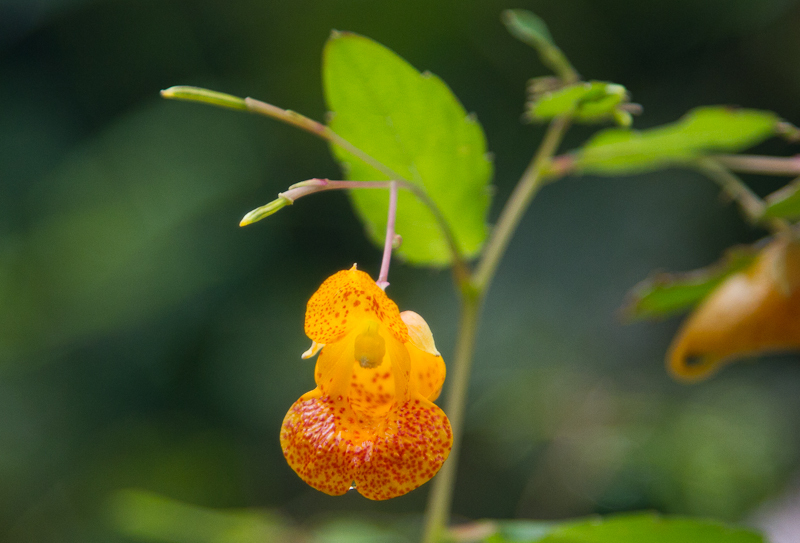 Despite their misleading nickname— touch-me-not— the innards of jewelweed’s succulent stems can be used to treat poison ivy, bug bites, or other skin irritations on the trail. Jewelweed is also known as touch-me-not because, if the seed pods are ripe when touched, the seeds will pop out of their dangling pendant pods. You’re safe to touch these pretty creekside blooms, but be wary of their common neighbors, stinging nettle and poison ivy! If you get out on the trails soon, you’ll still be able to catch the beautiful white blooms of roundleaf thoroughwort, a perennial plant with bundles of delicate white flowers. A member of the aster family, roundleaf thoroughwort has many porcelain flowers in each of the small floral heads. 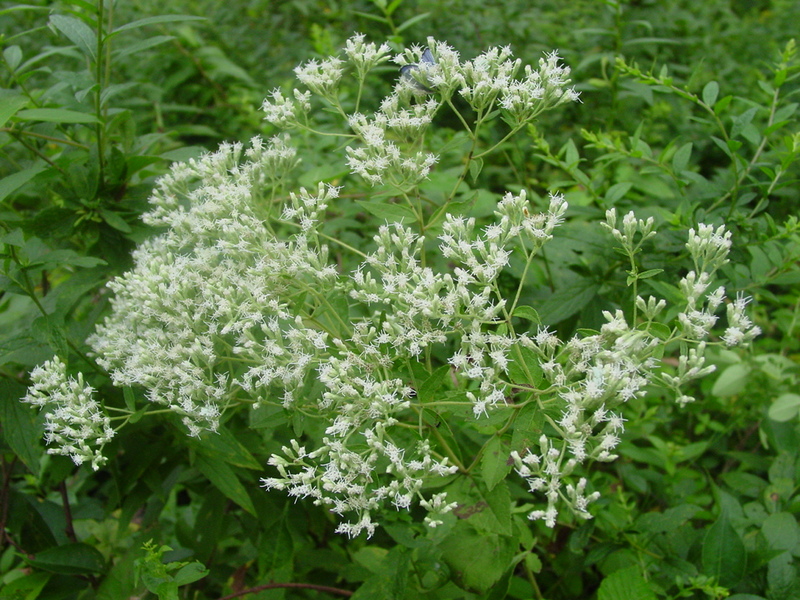 Eupatorium rotundifolium stands at about three to four feet tall this time of year, fully matured before it crawls back to the soil in wintertime. 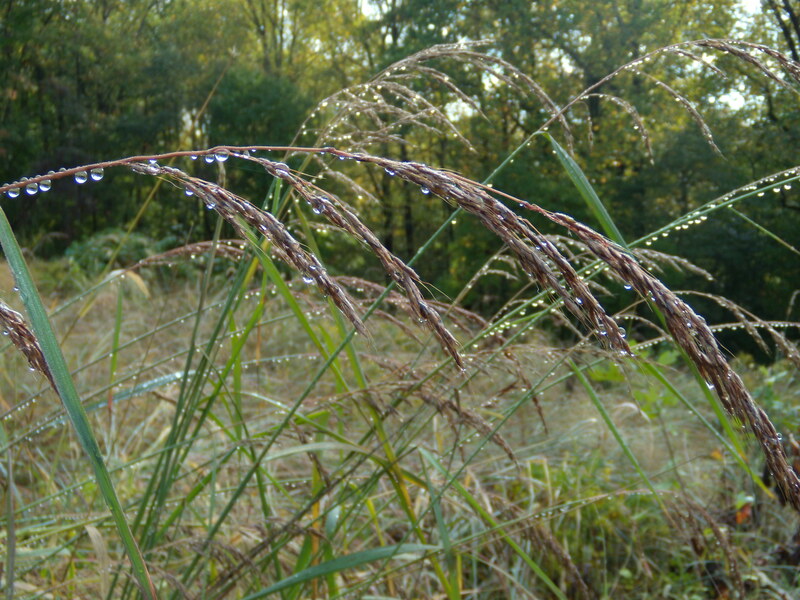 Much like Indiangrass above, switchgrass is another important native tallgrass, reaching up to five feet tall. Generally, Switchgrass is not quite as tall as Indiangrass, but due to its rhizomatic root structure, its roots can extend up to 10 feet underground! 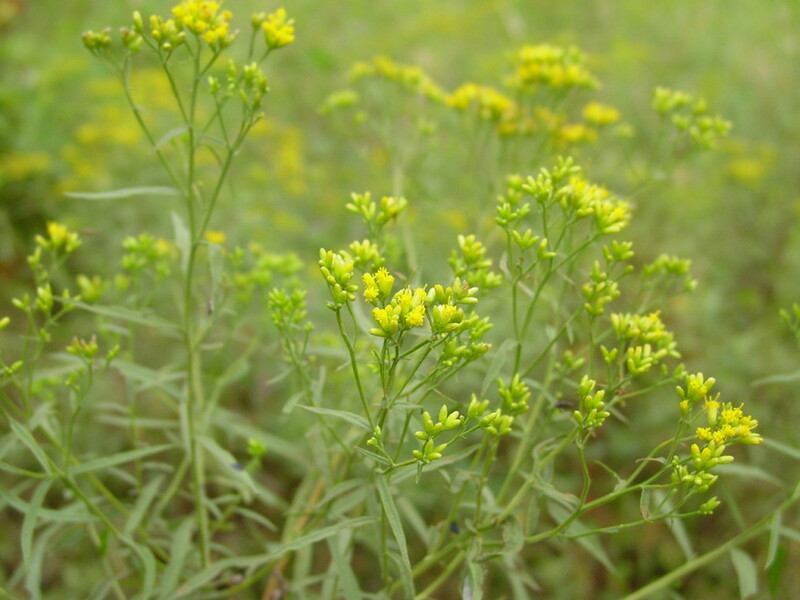 It can be found in dry soils, in prairies, open woods, or growing by train tracks in large clumps. Switchgrass is known for its particularly sturdy vertical growth structure, and is also referred to as panic grass, thatchgrass, and wild redtop, due to the pinkish tinge of their tufted panicle blooms.